A patio creates a dedicated space for outdoor living. It may be an area near your back door used for entertaining guests and grilling, or a secluded corner of your property used for quiet reflection. The intended use of the patio and how it will fit into the overall landscape design will help to determine the size, shape and material of your patio. It is important to create harmony within the landscape, with each feature flowing into the next, and this is why each patio we build is a unique creation. We often border the patio with landscape and garden beds to separate them from the lawn. These also help to enclose the patio space, creating a feeling of comfort and privacy. Plants also add color and interest to the landscape and soften the appearance of the hardscape materials. These, combined with elegant pathways and stairs that connect your landscape features, are the finishing touches that make your yard enjoyable to you and your guests. The materials to choose from are nearly limitless. Our landscape designers will work with you to choose a material that matches the overall design, while considering the use of the patio and anticipated traffic demands. The experienced crews at Green Acres are familiar using a variety of products and materials to meet the needs of our customers. View our resources page or visit our Anchorage retail center to learn more about available materials. The external beauty of your patio will not last if proper care is not given to what lies underneath. 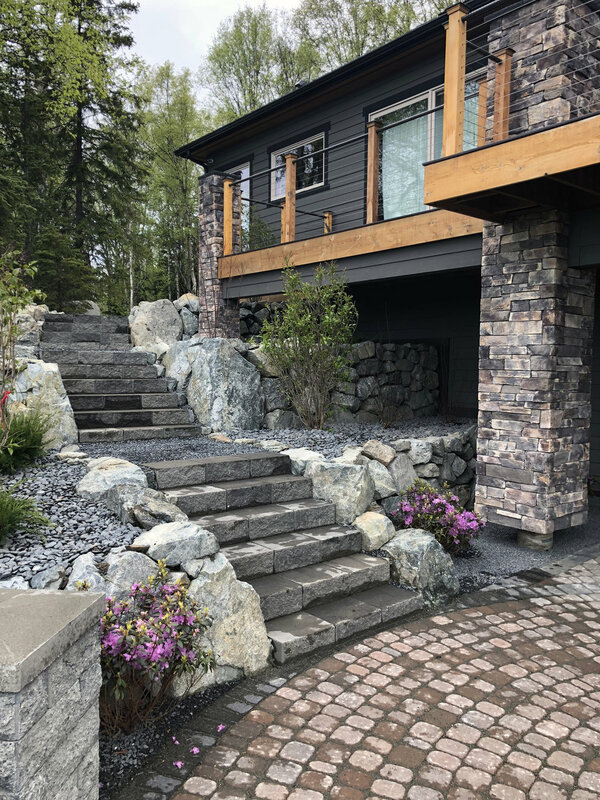 At Green Acres, we are experienced with the local soil types and how these are influenced by the harsh Alaska environment, and we take the necessary steps to ensure our installations withstand the tests of time. Our minimum site preparation includes a soil membrane to separate the native soils from our Non Frost Susceptible (NFS) backfills. These backfills include 1’ of NFS gravel, 2” of an NFS aggregate for surface leveling, and 1” of mason sand. Deeper excavation and backfill may be required for places with poor native soils and/or heavy traffic areas, such as driveways. Due to the many variables, such as subsurface preparation and products, the price of patio and pathway installation may vary. However, a typical installation price including all material may range from $22 to $35 per square foot. If additional excavation and NFS gravels are required, you may expect an additional $2 to $3 per square foot for each additional foot of depth.